Reviewing an exhibition of Dave Heath's photographs from Korea, Jacob Deschin of the New York Times, wrote, in 1958, "Mr Heath is a relatively new photographer and truly a discovery. His pictures reveal compassion and understanding, penetration and a masterly use of the medium." Heath had photographed his fellow soldiers in the winter of 1953/54--the early months of a tenuous truce--producing a suite of introspective portraits permeated with the malaise of war. It was a body of work that defined the young photographer as an artist. The 1958 exhibition--a set of virtuoso prints--remained intact, and it is from this exquisite collection that Lumiere Press has shaped our new limited-edition book. 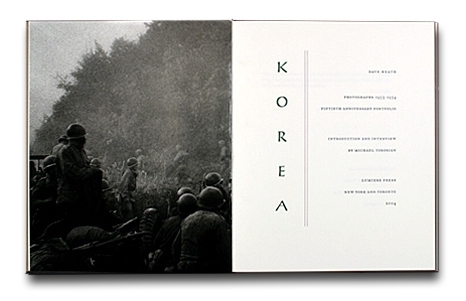 Heath's reminiscences of Korea, along with an introductory essay by Michael Torosian, amplify the stunning portfolio of twenty-six black and white photographs and one never-before-seen color image. Korea has been composed in the rare typeface Linotype Falcon, and printed letterpress on Biblio paper, a mould-made sheet. Heath's printmaking has been replicated through stochastic tritone lithography. The images have been printed on Utopia Premium paper and varnished. The book has been hand bound in Japanese Asahi bookcloth and Bugra mould-made paper, patterned in black and gold, over boards.